For the last few years, I have had the opportunity to work on some of the coolest Apache Spark committers, contributors, and projects. As luck would have it, I got the opportunity to meet my co-author Tomasz Drabas (author of the awesome Practical Data Analysis Cookbook) while we were solving some other cool Apache Spark projects. 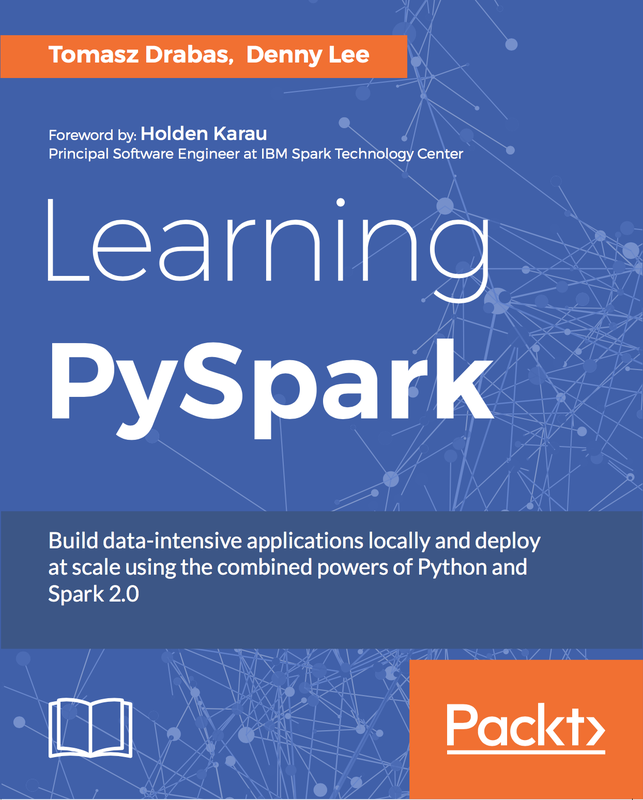 In the process, we joined forces to share our lessons learned that will hopefully help you jump start your Python and Apache Spark projects with our book: Learning PySpark. Apache Spark is an open source framework for efficient cluster computing with a strong interface for data parallelism and fault tolerance. This book will show you to leverage the power of Python and put it to use int he Spark ecosystem. You will start by getting a firm understanding of the Spark 2.0 architecture and how to set up a Python environment for Spark. You will get familiar with the modules available in PySpark. You will learn how to abstract data with RDDs and DataFrames and understand the streaming capabilities of PySpark. Also, you will get a thorough overview of machine learning capabilities of PySpark using ML and MLlib, graph processing using GraphFrames, and polyglot persistence using Blaze. Finally you will learn how to deploy your applications to the cloud using spark-submit command. By the end of the book, you will have established a firm understanding of the Spark Python API and how it can be used to build data-intensive applications. As well, follow these links for instructions on how to install Spark on a local machine and how to subscribe to some Spark offerings in the cloud. Awesome Denny. Can I get a copy with your autograph?